What’s This? TL;DR. Over the past 20+ years, my travels have taken me to almost all corners of the world. From 1997–2000 I had a backpack, shoestring budget no permanent address, and the goal of seeing how as much of the rest of the world lived as I could — in order to figure out how I could best serve the world, professionally. Throughout these and many later adventures, I kept travelogues. I wrote, and wrote, and wrote. At the time (pre-Blogger) I shared these missives with close friends and family by email. Since then, a few snippets have appeared online. It’s time to dust them off and share them with the world. Bolivia remains one of my favorite countries in the world. I was held up at gunpoint, nearly froze, and got rather sick in the silver mines. More challenging, surprising, scary and inspiring than I expected — and entirely worthwhile. Perspective: this was written in 2004 with a newbie-to-Bolivia mindset. I was at a different point in my life, and of course Bolivia was at a different point in its history (not least, pre-Evo Morales). Although I have returned to the country, I doubt that my initial impressions will ever be matched. Length: this is admittedly long. I’m sharing it with the intention that whoever wishes to read it can enjoy as much (or as little) as she likes. My hope is to inspire others to go off the beaten path, to Bolivia and the Andes, and see the world through a fresh lens. ¡Disfruten! I do not want to speak too early, but I have a feeling that Bolivia is going to end up being an all-time favorite place. My time in-country was far too short, and already I have a long list of places to return to visit. It is difficult to put my finger on precisely what is so attractive about the place. Perhaps it is the positively stunning scenery, which when coupled with (literally) breath-taking altitude creates an almost hallucinogenic experience. 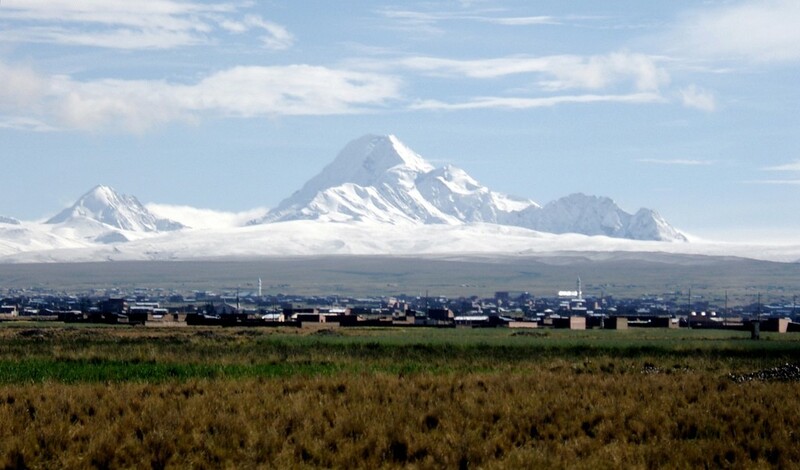 With cities located at 13,000+ feet (4,200+ meters) Bolivia is also known as the “Tibet of the Americas,” and given its isolation, ruggedness and altitude it is easy to understand why. Or perhaps it is the remoteness of the place, which given the notable lack of infrastructure (e.g., dirt roads still connecting some of the largest cities) makes you realize that you are a world away. Or perhaps it is the super-friendly people, who greet you on the street as if they have known you for ages. Or perhaps it is because Bolivia is the kind of place where in a single day, without seeking or trying, one can see or experience (as I did) one local market, three spontaneous fiestas in tiny pueblos, one bullfight, one scenic island hike, 30 car blessings, and one stunning sunset without people, electricity or noise of any kind to disturb the view. My best conclusion is that it is some combination of all of these things. 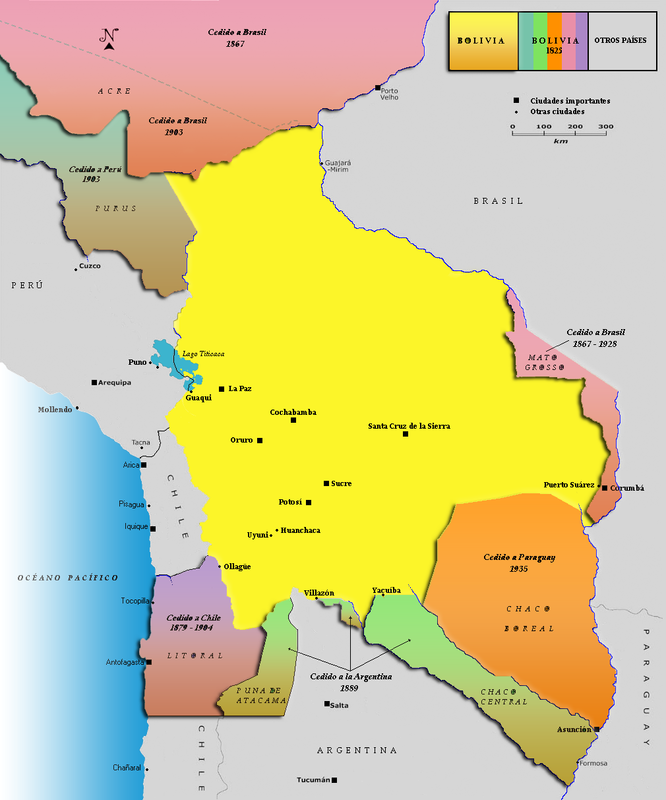 Bolivia is a country that has been “forgotten” historically in many ways, both within South America itself and with regard to the broader international community. Ever since the silver ran out and the Spaniards left, it has been relegated to backwater (pun intended: it’s landlocked, without much water other than Lake Titicaca and mountain runoff) status, both politically and economically. The country has lost over 50% of its territory since Simón Bolívar proclaimed independence in 1825, due to various wars and other scheming by its neighbors Paraguay, Chile, Brazil, Peru plus a host of U.S. and British corporate and government-sponsored entities meddling in internal affairs. For example, the disastrous Chaco War between Paraguay and Bolivia in the early 1930s was essentially set up by the petroleum interests of Standard Oil backing Bolivia and Shell backing Paraguay. In the end no oil was found in the area that was the crux of the dispute, but Bolivia lost a huge chunk of land. Not only has the country shrunk in size, but its political stability has often been in question: there have been 192 governments since 1825. 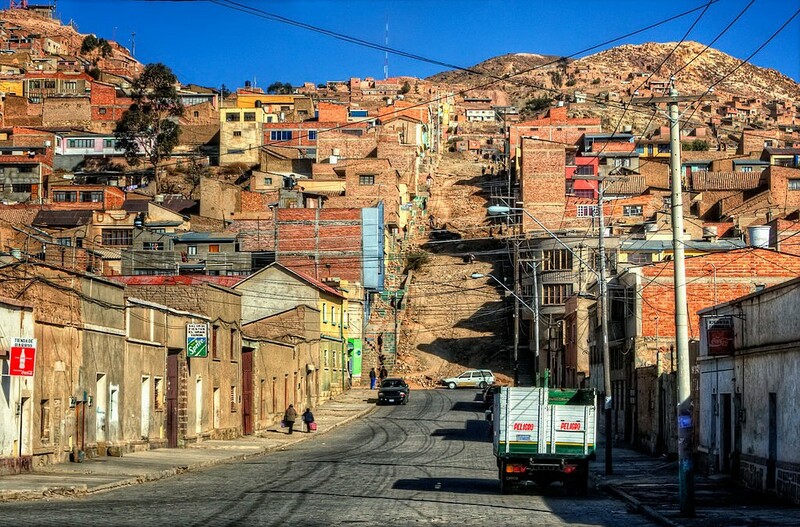 Economically Bolivia is one of the poorest countries in all of South America. 70% of its total population of 8 million people live in poverty, and the average household income is $2200 per year. (I was stunned and disappointed to see “microcredit” storefront signs, which turned out to be pawn shops. That said, Bolivia also has what is considered by many to be a robust and progressive microfinance sector.) I was also stunned and encouraged daily by peoples’ ability to do so much with so little and with good humor. That attitude would serve me well throughout my time there. I arrived in Bolivia by land, specifically a shock-absorber-less local bus from Peru. A few kilometers after the border crossing — stunning, I might add, across the Andean cordillera — I arrived at my first destination: Copacabana, on the shore of Lake Titicaca. The Incas reached as far as the lake, which they called Titi Khar’ka, which means “rock of the puma” in the Aymara language. However this was too hard for the Spaniards to pronounce, hence Titicaca. The name Copacabana itself is derived from Kota Kahuana, which is Aymara for “lake view.” And what views, indeed! 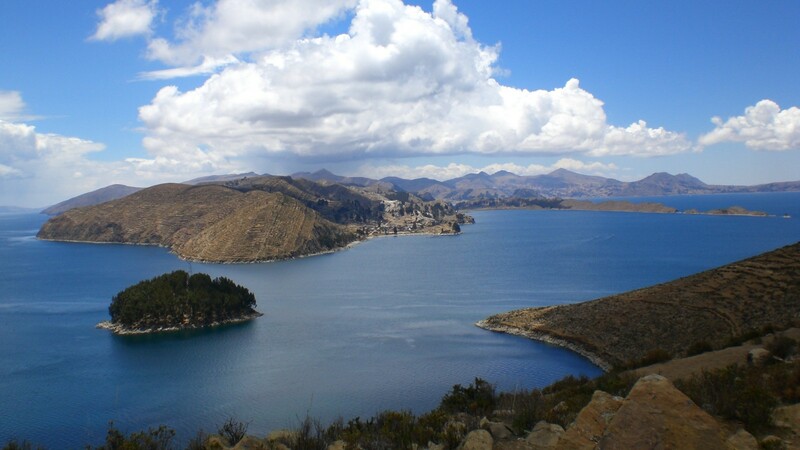 I arrived in town early enough to take in a few sites and plan the next day’s trip to Isla del Sol, located in the lake. By far the most interesting event in Copacabana town was the twice-daily “cha’lla” blessing which occurs in front of the huge, whitewashed, Moorish-influenced cathedral. Cha’lla is a blessing or supplication to Pachamama (earth mother) and other pagan gods that might affect one’s luck, health, or whatever the case may be. And let me tell you, Copacabanans love their cha’lla. At 10am and 2pm most days, there is a swarm of vehicles in front of the cathedral. Each vehicle — sedans, trucks, even buses — is ornately decorated with bright ribbons, flowers, confetti, silver car-tiara sorts of things and all imaginable type of votives. The block in front of the cathedral is packed with stalls selling all this stuff. When it is time for the blessing, cane alcohol is sprinkled on the vehicles, everyone celebrates, and — hopefully — the drivers are ensured of safe travels and the cars are ensured of a long life. As for me, I just enjoyed watching the spectacle and how seriously most of the people took it. Isla del Sol is located 1.5 hours by putt-putt boat from Copacabana. I had been told that it was very peaceful and had great hiking, but other than that was unsure what awaited me. Upon arrival I was greeted with a very steep, straight-up hike to the top of the island. From there, I did not want to leave. The island has no roads (only small footpaths and two-lane dirt tracks), no cars, and not even much electricity. This is more than made up for by its expansive crystal-clear vistas over the lake all the way to the snow-capped Bolivian Cordillera Real with peaks as high as 18,000 feet (5,800 meters), numerous donkey paths that criss-cross the island, and kind villagers. The island has a distinctly Aegean feel to it, and if not for the different architecture, dress and skin color of the people (and cordillera views on the horizon, of course) I might have thought I’d been transported back to the Greek islands. I took a long loop walk around the island by day, was invited into an island wedding ceremony (my first opportunity to see a group of Bolivians really drunk — entertaining, but once is enough!) and was followed back to my hospedaje (family lodging) by a small shepherd boy playing his pan flute just in time for sunset. The sunset alone was worth the trip! Given the high altitude and absence of environmental distractions or city lights, I am convinced that the sun shone brighter as it set, the stars shone brighter throughout the night, and one can’t get much closer to the heavens on earth. While watching the Isla del Sol sunset with a cerveza in hand, I realized that I had no water left to drink. Venturing out without much hope of finding anything, I ran into a tiny old lady who I asked for directions to anywhere that might have water. Her eyes immediately lit up as she replied, “Oh, I have a kiosk. Come with me!” We switched directions and started walking… little did I know that her store-shack was 15 minutes away, nearly in the next village. But she was so kind, and kept chatting the entire way, that I could not resist. By the time we got there, I felt badly only buying water, so I purchased also two candy bars and a package of biscuits. I spent a grand total of 70 cents. 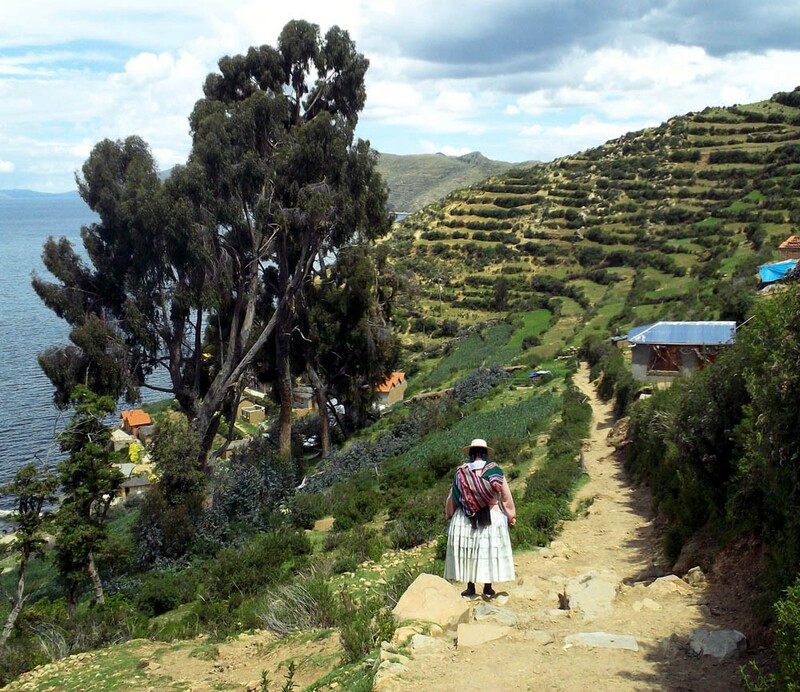 Speaking of costs, Bolivia remains bargain for travelers. On average I spent USD $2.50-$5 for a single room with private bath, $1.50-$2 for a 3-course set meal, $6 for a 10 hour bus ride, and $1 for a liter of beer (which is more than twice the price of a liter of either water or gasoline). La Paz (aka La Ciudad de Nuestra Señora de La Paz) was founded in 1548 by the Spanish captain Alonzo de Mendoza. It was originally established due to its proximity to the large quantity of gold found in nearby Rio Choqueyapu (which is now completely contaminated and runs neon-orange just south of town). Although the gold has long since run out, the city can still claim to be the highest capital in the world with an altitude of nearly 3,700 meters (12,500 feet) — and the soroche (altitude sickness) that accompanies it should not be understated. I huffed and puffed the entire time I was there, but that did not stop me from enjoying the city. Highlights included the witches market, the coca museum, and the overall street scene. The witches market is renowned for its (shall we say) “unique” products and potions for sale, including dried llama fetuses and herbs used to supplicate the pagan gods that might be feeling fickle or feisty. I was told that the llama fetus is to be purchased in anticipation of the purchase of a house, but that a real llama should be bought and sacrificed if the potential house-buyer can afford it. The coca museum was comprehensive and presented in a refreshing manner. I learned all sorts of interesting and random things, from lamamacoca (coca leaf-readers who apparently can tell the past, present and future from the leaves) and exactly how the acullico (coca leaf chewing process) works. But most memorable for me was the emphasis on coca as a cultural symbol and anchor, and not as part of the drug war. Coca and cocaine are two entirely different things; several additional substances and chemical reactions are required to produce cocaine, and the US-led drug war in Bolivia does not attack the correct target (or attack it in the correct way). In my opinion the problem lies equally if not more within the United States itself, for while the U.S. contains only 5% of the world’s population, it is responsible for over 50% of the world’s cocaine consumption. Is it fair for the U.S. to stamp out a symbol of Bolivia’s cultural heritage (keeping in mind that there are still several entirely legal coca markets in operation today, primarily for casual chewing and for making harmless mate de coca) for the benefit of addicts in the U.S.? I realize that the drug war needs to be fought on many fronts, but I definitely question the U.S. government’s strategy more than ever before. What is the fair balance? The coca museum also contained a section on Coca Cola which I found ironic. Did you know that Coca Cola today does not contain cocaine, but it does use the coca leaf as a taste enhancer? Having been to the Coke museum in Atlanta, I found it almost surreal to see photos of Coke founders (and Emory University benefactors) Woodruff and Candler in La Paz, of all places. One event that was most definitely not on my itinerary — and in fact was one of the scariest travel experiences I have ever had — occurred on my third day in La Paz. My plan had been to go bike riding down “the world’s most dangerous road” outside of Corioco (an average of 26 vehicles per year go missing off the edge of the road!). But I was the victim of a nasty scam instead. Whether the road or the scam was more dangerous, I’ll never know. The morning began tranquilly enough. I was walking up a hill in search of the musical instruments museum, in full daylight and close to the city’s historic center, when I was approached by an elderly man who clearly (at least to me) was also a tourist: hiking boots, baseball cap, and map in hand. He told me he was from Chile and asked me if I could please direct him to the costume museum. I informed him that I was not aware of it, but according to my map the ethnography museum was nearby. At precisely the moment that we were discussing directions, another man approached both of us and asked to see identification. When I asked him why — and right about the time I noticed his row of gold teeth and gun peering out of his midriff — he pulled out his wallet and produced identification indicating that he was a police officer. I had read that undercover police exist throughout Bolivia and should be taken seriously, and that the key is proper identification. He asked both of us to accompany him to the police station so that he could do a standard “tourist search” of sorts, which I’d read meant basically searching us for drug money. By now I was feeling a bit anxious; admittedly the gun scared me, but the Chilean man was cooperating fully and reassured me that we would go together. Because of the gun, I resisted the temptation to bolt then and there. We got in (what looked to be) a marked police car nearby and began driving to the station. At this point in time the head-honcho still had my passport, so I was pretty much stuck. Within minutes — or probably seconds, as time seemed to stand still — we were driving in circles, along dirt roads heading up and sideways, and my mind started racing. I was becoming disoriented. Then the driver stopped the car, and the ring-leader-with-the-gun turned around and demanded my entire bag “to search for drug money.” Still worried about my safety, I handed it over. With one hand on my daypack and the other hand on his gun, he sniffed through my bag, took a look at my camera and credit cards, made a “check” of my ATM card by calling the Central Bank (yeah, right…) and handed it back to me. When I demanded my passport, the driver started driving again. Then I started screaming in Spanish and thought to myself, enough is enough, this is not going well. As we went through the next intersection and, I assume, he’d had enough of my yelling, Mr. Gun-and-Gold-Teeth reached back and gave me my passport. I noticed that his hand was trembling. When we rounded the next corner, I punched the car door as hard as I could with my elbow and foot, rolled out of the moving vehicle and did an inelegant but effective Hollywood-style somersault, and scrambled to my feet. Then I bolted. I didn’t know where I was, but I did know that down would bring me closer to the city center. (Thank you La Paz geography, after all.) So I ran down, down, down. That evening, part of me just wanted to leave and forget Bolivia. But the bigger part of me couldn’t erase the fact that I had so thoroughly enjoyed my time in Bolivia so much up until then. So I resolved not to let the incident dampen my spirit and excitement about my travels-still-to-come in the country. Call it a sixth sense. The next morning I re-shot as many of the lost photos as possible, treated myself to an extra dulce de leche, double-locked my backpack, and in the afternoon headed out of La Paz towards the southern towns of Oruro and Uyuni. 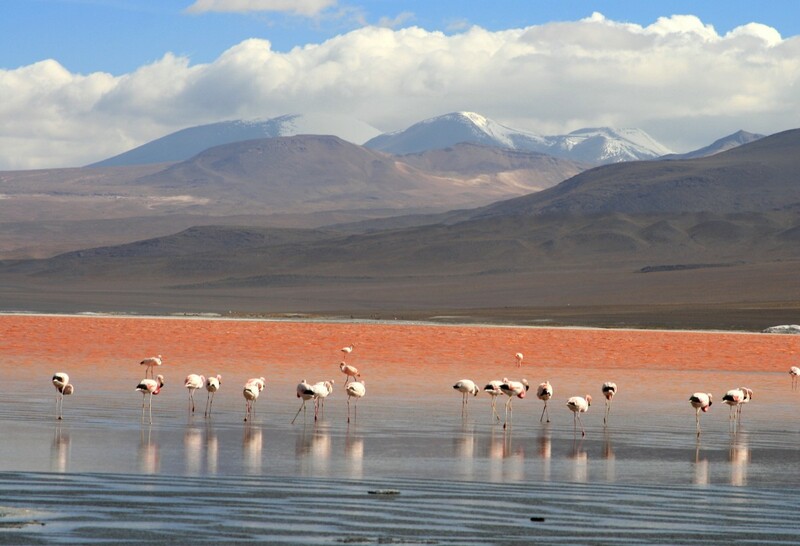 Oruro is not much more than a built-up, predominantly gray transport hub; Uyuni is a somewhat more colorful version of the same. Uyuni’s city hall is pale yellow and the clock tower resembles a miniature Big Ben. Equally other-worldly is the Minuteman Revolutionary Pizza Place run by a guy from Amherst, Massachusetts who married a Bolivian woman. We had a nice chat about the Minuteman bike trail. Small world! Far more memorable than the towns was the bus ride to get there, and the majestic Salar de Uyuni which was the point of the entire excursion. The 15 hour bus ride was awful and gives “teeth chattering” new meaning. 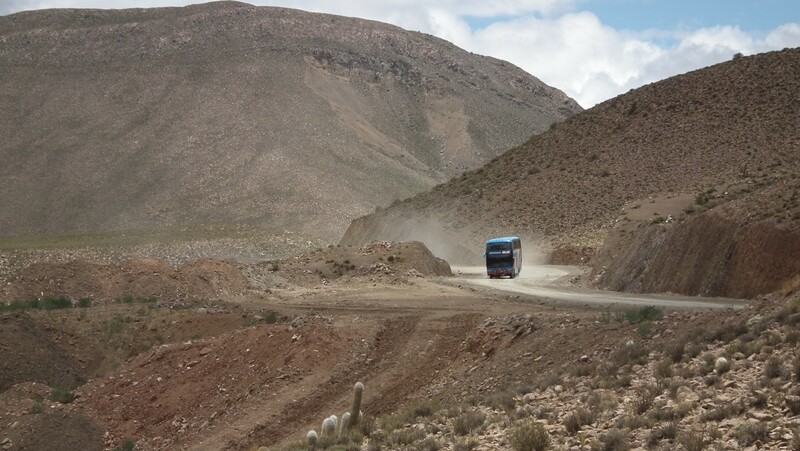 There were no shocks on the bus (again), the gravel road was full of pits and holes and deep ditches on the sides (which we dove into with alarming frequency), and the driver thought he was a Bolivian Formula One racer. I couldn’t even steady myself long enough to ask my seat companion how much longer we had to endure the ride. Thankfully we arrived a whopping two hours early (at 3am instead of 5am) and the trip provided ample stargazing opportunities. I saw more shooting stars in Bolivia than ever before, perhaps because the sky is so thin and the entire galaxy is on display with nothing to disturb it. My four-day trip to the Salar de Uyuni was worth every bit of difficulty, discomfort, and freezing night spent to experience it. 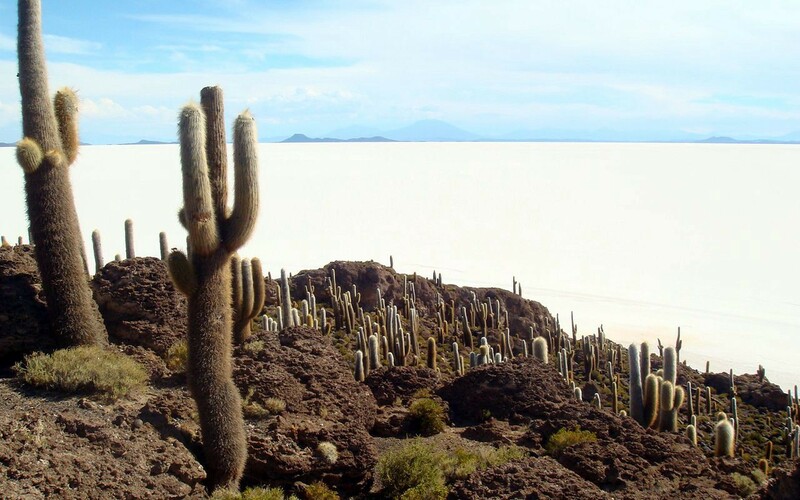 “Salar” means salt flat, and at 3,500 square feet the Salar de Uyuni is the largest salt lake in the world. It originated approximately 10,000 years ago as part of ancient drainage of Lake Titicaca: basically, Titicaca started drying up and the Salar de Uyuni got left behind. The first day of the voyage was spent exploring this bleached-white no-person’s land, which included time in Colchani (a small pueblo where the refinement and processing of the salt still occurs with traditional pick-axe methods) and a visit to the Salt Hotels (yes, buildings built entirely out of salt bricks). However the hotels have been closed for business due to environmental concerns. Apparently the builders did not take into account that hotel guests would need water, would leave trash behind that would need to be dumped, and that sort of thing… hmmm. The highlight of the day in the salar was the Isla del Pescado (aka Incahuasi Island in the native Quechua language), named “fish island” for its illusory fish-like form when seen from afar on the salar. It was there that I felt most in the backside-of-beyond, middle-of-gorgeous-nowhere. It stands alone, covered in tall saguaro-type cactus, surrounded by a retina-piercing white expanse for as far as the eye can see. You’re not sure if you are on the moon or in a surrealist’s dreamscape. The characteristics of the place allow for plenty of optical illusions, like “shrinking” people and things. We had fun with photography tricks, for example taking pictures of each other holding a truck in our hands or balancing someone sitting on our heads. We left the Isla del Pescado right at sunset, and the memory of our Jeep racing towards the edge of the salt flat as it became dark, with shades of lavender, cornflower blue and pastel yellow disappearing behind us remain seared in my mind. The salar expedition included more than just salt flats: lagunas, volcanoes, geysers, endangered wildlife and thermal baths, to name a few. The second day focused on lagunas — and lots of dusty driving. We passed through scenery that was straight out of a Georgia O’Keeffe painting (with rock formations by Salvador Dalí mixed in) to get to the Lagunas Cañapa, Hedionda and Ramadita. Lonely Planet’s description of the mountains as resembling “spilled chocolate sundaes” is perfect; I would only add that cherry, vanilla custard, and pistachio ice creams are in those mountains as well. So many rich, deep, and pastel colors in the terrain! We stopped at each of the lagunas, both to appreciate their beauty and to view the wildlife. Our ultimate destination and home for that night was the Eduardo Avaroa National Reserve, home to three of the six varieties of flamingo in the world and also provides protected habitat for Andean rheas, endangered vicunas, pumas, foxes and unique flora such as the llareta plant (which looks like a cross between a head of lettuce and a clump of neon-green thick moss). It was difficult to remember all the animals, as at times they started to look the same. Is it an alpaca, llama, vicuña, or guanaco? Arriving at the Laguna Colorada for that night, we had been advised that the temperature would be cold and windy. Understatement! There was no heating or running water, and the electricity cut off early which meant that we were all huddled in our sleeping bags by 8pm. The temperature variations in the area can be vast, going from -25°C to +25°C (-13°F to +77°F) in a single day. The next morning the water bottles in our room had turned to solid ice. 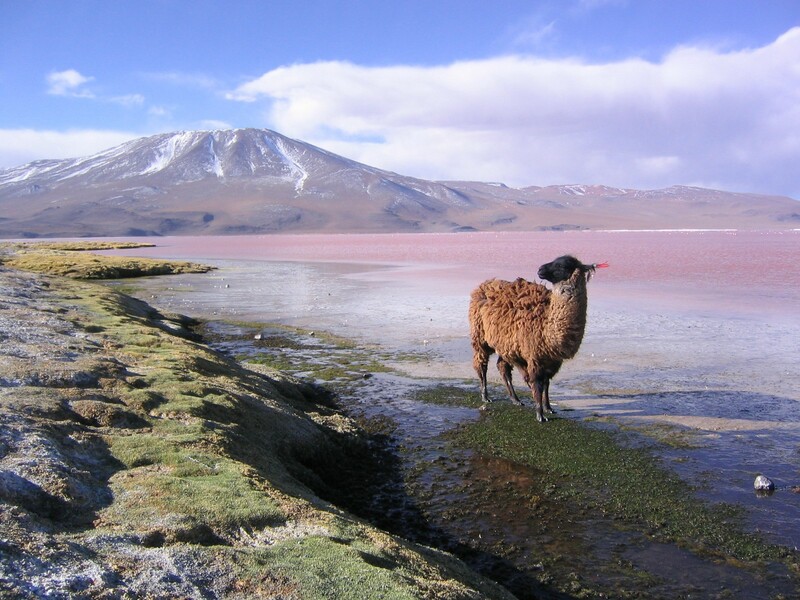 The temperature is also partly responsible for making the Laguna Colorada red, Laguna Verde green, and Laguna Blanca white. More physics and geology are involved, but beyond the scope of my comprehension. All I could say is, wow. The following day kicked off (painfully cold) at 5am, when we headed for thermal baths and geysers. Due to the relatively young development of the tourism industry in this part of Bolivia, you can still climb in, on and around the geysers. Painfully hot (and smelly, due to the sulfur) cave-ins do occur, something I cannot imagine the park rangers of Old Faithful allowing. But still, stinky fun for those willing to take the risk! From the geysers the route headed through more lagunas, past the 5,100 meter (17,000 feet) Volcan Licancabur and back through the Valley of the Rocks. We came close to the Chilean border, where I’ll be in a couple months’ time. From here the terrain changed distinctly once again, this time reminding me of Utah in the spring (other travelers said it reminded them of New Zealand as well). Lush green vegetation abounded, and I never realized that multi-colored rock rubble could be so pretty. Towards late afternoon we arrived in the tiny village of Culpina, where we would spend the night. Not expecting much, I headed out to wander around the two square blocks of town. Little did I know that soon I would find myself on the local football field, playing with local kids and Coco the llama (who doubles as the kids’ playmate). What fun! There was no need for verbal language, and the kids could not get enough piggyback rides and being swung around maypole-style. At the same time I could not help but feel concerned about the fact that both 2 year olds (with infant teeth) and 8 year olds (with adult teeth) have rotten teeth, and the nearest dentist is in Uyuni some three hours away. Further, the 3 year olds simply did not speak — not even with their mothers (who admittedly did not speak much either, so perhaps it was a kind of timidness-around-boisterous-foreigners thing). Speaking of language, our hosts that evening were a delightful family who taught us the words to various Bolivian love songs as well as 1,001 handy uses for an empty wine bottle. Another inspirational example of how to do a lot with few physical resources and much good humor. We arrived back in Uyuni the following day. Before leaving town, I checked out the local “train cemetery” (a rusty photo opportunity but not much more) and by chance was interviewed by a couple of World Bank field researchers about the facilities and services offered in the Uyuni area. From here it was time for another night bus (the only choice out of town, but at least this one arrived at 1am which meant that I could get half a night’s sleep) to Potosi. More endless kilometers, more time to reflect… this time, how about food? Prior to arrival I had not expected anything grand from Bolivian cuisine, and upon departure I can say that I got what I expected. However, at the same time I was most impressed with the Bolivians’ culinary creativity with few ingredients. The basic dietary staples are corn, beans of every type, peanuts, tomatoes and meat, which are mixed and matched every which way. For example, there are more types of mani (peanuts) than I have ever encountered: roasted, sugared, boiled, covered in confectionary, almost burned, totally burned, etc. And an educated traveler soon learns the difference between salteñas, empanadas, and humitas. While each of these filled pastry packages contain some combination of meat, cheese and vegetables, the dough/crust is different. 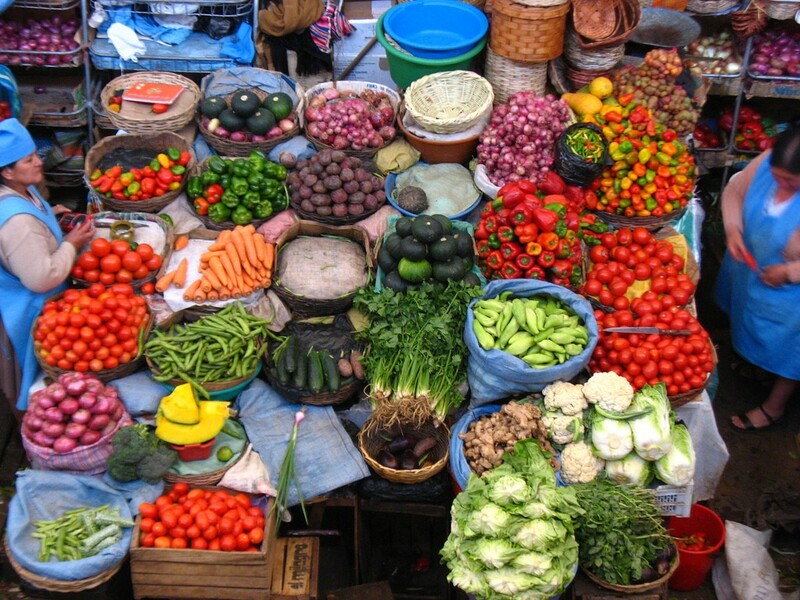 For the price of 20 cents, any one of them is warm, delicious treat when served fresh from a street vendor. The most memorable Bolivian dish that I ate was charque khan, which is basically mashed hominy (from a dizzying array of corn varieties) with chunks of dried llama meat and doused with fresh cilantro. More often I encountered “internationalized” dishes that incorporated the Bolivian staples but added a twist — for example, pasta with Bolivian meat, chicken with fire-hot Bolivian chilli sold under the name of “curry”, and nachos with everything-under-the-Bolivian-sun on them. Much to my sweet-tooth’s delight, the country has quite a few sweet treats available. Favorites include the fresh fruit juices (made with water, milk or yogurt) and dulce de leche in bar, liquid, and nutella-consistency varieties and folded into all sorts of pastries, often topped with shaved coconut as well. Yum! After arriving in the dead of night and taking my first shower in five days, I went out to explore Potosi by day. The first things that struck me were the intense sun, the biting cold air and an even greater inability to breathe (the city is at 13,300 feet / 4,050m elevation). The history of Potosi is pretty incredible and very sad. The summary version is that in 1544 silver was discovered in the surrounding hills, and the town was founded the following year. Legend has it that a shepherd could not find his animals in the middle of the night, struck a match to light a fire, and within two minutes silver was melting in his hand. The Spanish quickly gained possession of the area (at the time the city was formally part of Peru) and used the profits from the mines to underwrite the finances of the Spanish empire for the next almost-200 years. It became an incredibly rich city, and even today one hears the expression “vale un potosi” (to be worth a potosi, which was the name of the silver coins minted there) to indicate something of great value. Thanks to silver Potosi grew from a tiny village to a city of 160,000 people in the 1550s (less than 10 years). This made it the largest and highest city in the entire western hemisphere at the time; it still claims the latter title today. Given its history, the difference between Potosi of the 16th century and that of the 21st is like night and day. Indeed, perhaps that is what I found most difficult to comprehend about the place: what it was like in centuries past, how grand it must have been. For the Potosi of today is a sad, cold, gray and bitter place. The Cerro Rico (“rich hill”) that provided so much wealth and prosperity to the city in the past continues to loom over it, but with dramatically different results (see below). By now so much of the silver and past glory has been looted, both literally and figuratively; there isn’t even any high-quality silver for purchase, should tourists or anyone else wish to. The town’s cathedral is a carcass of what used to be; granted, it was rebuilt after the city’s heyday, but nevertheless contains no silverwork, and faux marble striations along the molding are drawn on with magic marker. The Casa de la Moneda (royal mint) and a few still-operating convents house the only remaining treasures in town. Having served not only as a mint but also as a prison and the headquarters of the Bolivian army, today the Casa de la Moneda is home to a stash of equipment used historically to mint silver and turn it into various items. In the museum’s plateria (silver display area) there is a purse that literally has been woven by pure silver thread, such that it is as soft and supple as silver fabric. Such gorgeous and refined artistry! In contrast to the paucity of silver available these days in Potosi, one thing that I did encounter plenty of in town were abogado (lawyers) offices. I counted no fewer than nine in one city block, all of whom were independent lawyers who hung shingles out (although six appeared to be permanently closed). I’m not sure what the big legal deal in Bolivia is these days, but Potosi is prepared. 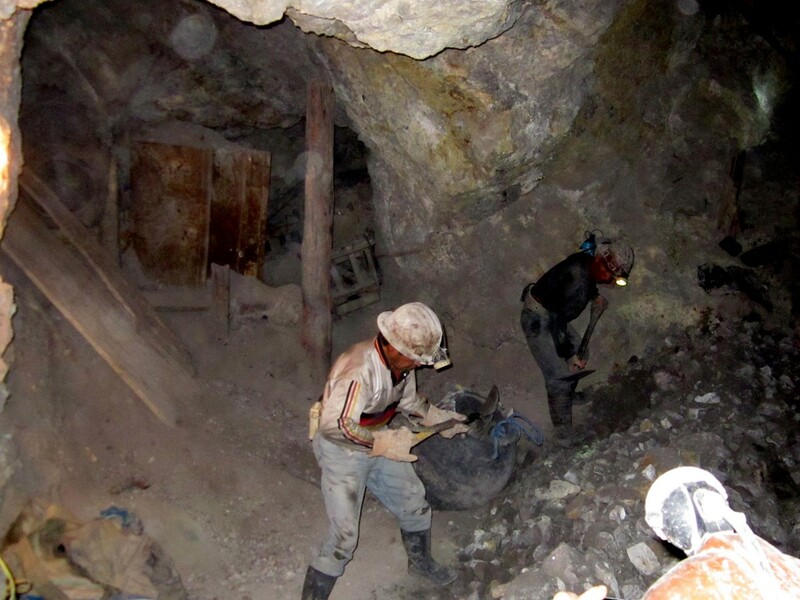 One of my main interests in going to Potosi was to visit the Cerro Rico mines. The silver mines of the 16th century have been in continuous operation until the present day, although tin, lead and zinc are now mined instead of silver. What has not changed however are the working conditions of the miners. They are very much just as they were 500 years ago when slaves were imported from Africa and elsewhere to work there. Travel guides call it “the job from hell,” and I wanted to experience the inferno full-on to see what, whether and how the situation currently is and might be improved for the the miners. To be honest, even days later as I write this travelogue I have difficulty comprehending exactly what I experienced that day and what can be done. The day began with a visit to the miners’ markets, where our guide and ex-miner Efraim explained the structure of mining in Bolivia today and prepared us for what was to come. Mining in the Cerro Rico is entirely independent, meaning you earn money only for what you pull out of the mountain. The number of miners working is directly related to the world price of the minerals. Higher prices mean more workers and vice versa (though 95% of miners state that they work in the mines “because there is no other work available”). Currently there are about 8,000 miners, who work in groups of 10–40 miners (since one person cannot lug two-ton carts of rock alone). Men begin to work in mines as young as 12 or 13 years old, and an “old” miner is anyone over age 40. Silicosis of the lungs generally kills a man within 10 years of entering the mines, to say nothing of other work-related toxins and hazards (like dynamite and transport accidents). Because it is an independent market, dynamite is freely available for purchase at the miners’ market, and you see five-year-old boys purchasing several sticks of it for their fathers. (If you wonder why I only speak of men going into the mines, it is not because women are prohibited. Rather, there are myriad economic and cultural reasons why they do not go there: care for the family, high incidence of illness and death, etc.) and this situation appears unlikely to change anytime soon. After the miners’ market we went to a ramshackle processing and distribution plant to see what happens to the minerals after being pulled from the mountain and before export. Then it was time to enter the mines ourselves. We geared up with protective and waterproof gear, helmets, boots and head lamps. We spent four hours in the mines, and descended to the 4th level of the mines; the heat and suffocation-feeling increases with each level, reaching as high as 40°C (104°F). By the time we got out I was ready to faint and choke. That said, the experiences inside were worth the sickness afterwards. We walked about one kilometer into the mountain before descending to the second level. Carts lugged by two teenage boys came careening past us in the middle of the dark passageway. The dust was so thick that I took my glasses off after five minutes because I could not see. The asbestos particles hung thickly in the air without moving and were easily visible with a head lamp. Thanks to Efraim, we spent the better portion of an hour sitting and chatting with the miners, some of whom also had been part of Efraim’s miner-work-group. We learned about things like work hours (usually from about 10am until 6pm, with a 10 minute break at 2pm to chew coca), habits (for example, miners never eat lunch, both because they lose their appetite by chewing coca and because any food they would eat in the mountain would be directly contaminated with toxins) and traditions (namely coca chewing). It seems that the hope and anesthesia provided by coca is the single most important factor contributing to the longevity of the appalling mining industry in Bolivia. Every miner I saw had a wad of coca leaves the size of a tennis ball in his cheek. It is used both as a food source (it is relatively rich in nutrients) and as a suppressant generally. Some miners are paid in coca leaves, which led me to wonder whether the role of coca encourages or constrains the continuation of the industry (and what is the most desirable and feasible path to mitigate this plight). I am not sure about the answer to this, but what I am sure about is that one visit to the mines is enough to have a sufficient appreciation for how hard life is there. From that one day alone, I had a hard time breathing (with “gunk” in my lungs) for the next four days. After the relatively tougher travel of Uyuni and Potosi, I was ready for a more comfortable environment. Time for Sucre, where I was shocked and delighted to see flowers abounding in the main plaza and to be able to wear short sleeves for the first time in weeks. It made me realize what a harsh(er) climate I had been living in during the weeks in the interim. At “only” 2,550 meters (8,500 feet) I could breathe easily again! Over the next few days I would discover several other ways in which Sucre’s population lives quite well, including an overflowing market, numerous clothing shops (even a tuxedo shop for men) with items I would actually consider purchasing, and the fact that most things are closed on Sunday. This last observation indicates that people in Sucre are actually living well enough to take a day off, which is something I had not encountered much elsewhere in Bolivia. Sucre is perhaps the richest city in Bolivia from historical and cultural points of view. The entire city is a UNESCO World Heritage site. Bolivia has three different capitals: La Paz is the political capital, Sucre is the judicial and artistic capital, and Santa Cruz is the economic capital. Sucre was the city where Simón Bolívar founded Bolivia and wrote its constitution after defeating the Spaniards in the early 1820s. The city is full of political-social history and events that influenced new republics in other Andean countries, particularly between 1640 and 1850. The day I arrived saw the Bolivian and Argentinean presidents in town to sign an accord for mineral development rights. There was lots of fanfare and a half dozen parades, which meant that I could not get to my hospedaje by taxi and had to walk through the mayhem instead, which was even better. 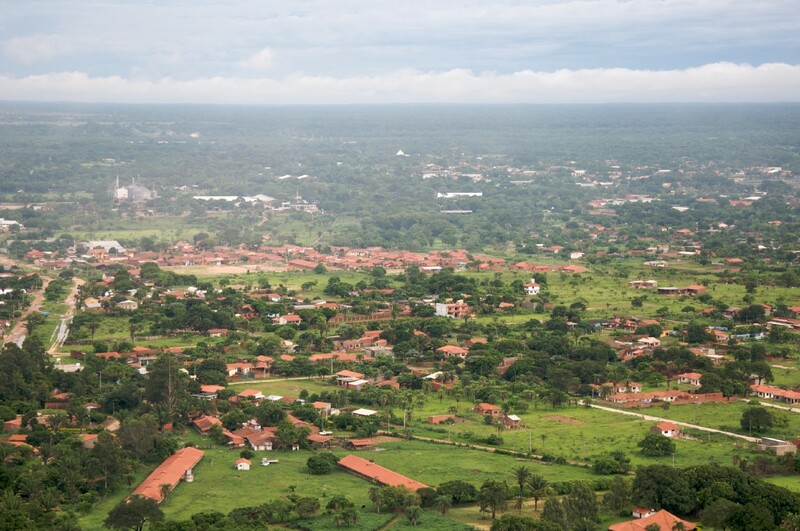 In addition to its judicial and cultural claims to fame, Sucre also is home to the University of San Francisco Xavier (which is older than Harvard) and holds the title of chocolate capital as well. So I found myself feeling closer to home than I had in quite a while. I spent three days in the Sucre area, exploring the city and environs and learning about the founding of the country. Simón Bolívar, aka “El Libertador,” was responsible for the independence of today’s Venezuela, Colombia, Panama, Ecuador, Peru and Bolivia. He was born in 1783, spent time in France and Spain as part of his education, and by the 1820s was back in South America to be part of Peru’s liberation from Spain in 1824 and Bolivia’s liberation from Peru the following year. Bolivia’s declaration of independence was signed at Sucre’s Casa de la Libertad, which is now a charming museum complete with a huge, four-meter high wooden bust of Bolivar. In the late 1820s Bolivar began working on his dream goal of “la Gran Colombia,” which was to be a single state comprised of present-day Venezuela, Colombia and Ecuador. However, Gran Colombia was doomed from the start due to regional and cultural differences between the states. By the time of Bolivar’s death in 1830, his popularity had waned; he died alone and was buried in a borrowed (or rather, donated) suit from a friend. For much of the 19th century Bolivar was a name not warmly recognized, and it has only been in the 20th century that a sort of Bolivar-is-great admiration has developed. Highlights of my time in Sucre included visits to the excellent textile museum and a day-long bike ride to Ka’talla and Las Siete Cascadas (seven waterfalls) with a Dutch cycling organization. It was fascinating to see the surrounding countryside of Sucre and how the area has developed. My only complaint about Sucre is its very limited and sporadic opening hours of many churches and museums. I was amazed to find some museums officially open only 1.5 hours per day, then to show up at that time and find them closed. Oh well… my favorite excuse for a museum closing early was that the workers had to go attend a strike on the main plaza. My question to them was: so why did they bother to show up for work that day in the first place?! Given that Sucre is the cultural capital, perhaps a small digression to the topic of Chola culture and dress. 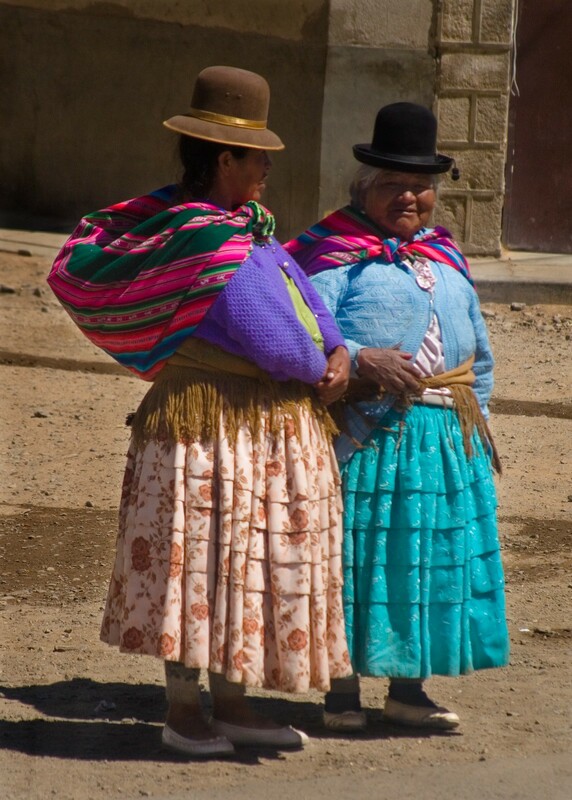 The term “Chola” refers generally to Bolivian Indian women, and if you have ever seen photos of Andean women with long black braids wearing bowler hats, then you are looking at Cholas. The distinctive dress was imposed on the native population by Spanish decree in the 18th century, but it has long outlasted the Spaniards’ departure. I guess the Bolivians found it comfortable, or maybe just did not have the wherewithal to change back. In any case it is very colorful, fun to admire, and also serves to identify one’s social status and place of origin. From top to bottom, the key Chola pieces are: the ubiquitous bowler hat (worn flat if married, and tilted to the side if single); the pocacha, a wool tuft that ties the ladies’ two long black braids together; the pollera, a short pleated skirt (Bolivian women often wear multiple layers of petticoats, which makes them look overweight around the hips even though in reality they are not); the chompa (all-purpose sweater); the llijlla (wool shawl); and finally the aguayo, a bright woven cloth carryall worn on the back and able to carry everything from small children to animals to a month’s supply of popcorn. My stay in Sucre was timed such that I could visit the Tarabuco market, held only once a week on Sunday, home to some of the country’s most colorful textiles and supposedly the best market in Bolivia. Sucre’s fabulous textile museum had prepared me for the basics of what was to come; I simply added my camera and desire to people-watch and have fun. Historically there have been two main textile-producing centers (also referred to as “cultural areas”) in Bolivia, Tarabuco and Jalq’a. Each has its own distinctive textile patterns and techniques. (The key distinction of “cultural areas” is whether or not the community is actively engaged in llama-herding — you can tell from the textiles whether or not they do.) Tarabuco and Jalq’a were central to Bolivia’s historical role as the Rio de la Plata viceroyalty’s most important textile center while the Spaniards were in power. However, with the departure of the Spanish and the opening of the Bolivian market to free trade and foreign competition, artisan textile weaving has all but vanished from Bolivia. Tarabuco is one of the few places it is still found. Textiles from Tarabuco are characterized by green, blue, and light colors on a white background. Designs are intricately organized, and depictions of animals and events of this world (my favorite is the children playing) are common. In contrast, Jalq’a textiles use red and black thread only, and they typically depict the underworld, imaginary beings, and chaotic designs. I like the Tarabuco weavings more and find the Jalq’a ones to be spooky. In any case, at the Tarabuco market I found more textiles than my eye could comprehend. In addition to textiles there are also bowler hat and musical instrument sections to the market. I particularly liked the wajra, a cow’s horn attached to a bamboo reed. Next door were more run-of-the-mill items like entire skinned animals hanging raw from a spit, enormous bags of coca leaves, and an ice cream vendor with the largest styrofoam box (from which to serve the frozen-melted-frozen again concoctions — not advised for travelers) I have ever seen in my life. Following my fun in the Bolivian foothills, it was time to head east into the Bolivian lowlands to my final destination, Santa Cruz (full name: Santa Cruz de la Sierra). It was my last night bus for a while, and 12 hours en route resulted in myriad changes. The morning light revealed a hot and humid climate (it reminded me of Panama with a touch of Nicaragua), palm trees, lush greenery and very easy breathing (we had been in continual descent through the night to less than 1000 meters (3800 feet). Moreover, I encountered the first rainstorm of my entire trip. So much for the desert dryness of the altiplano, where my lips refused not to be chapped. Compared to the cold, harsh climate of La Paz, Santa Cruz is balmy paradise. 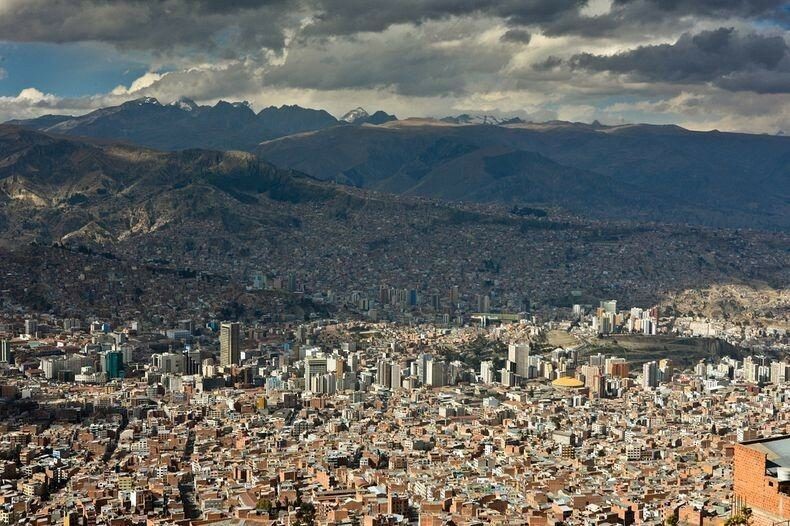 I was not surprised to learn that in 2003 Santa Cruz became the largest city in Bolivia. It was too hot for chocolate (because it melts), but that was more than made up for by the palatial heladerias (ice cream shops) on each block, serving up sundaes bigger than a basketball. Santa Cruz itself is not much of a tourist sight-seeing mecca. Rather it is a place to conduct business and to use as a jumping-off point for travel in the Amazon Basin. I saw a lot of publicity about both Brazil and Argentina, and the city’s proximity to and trade with these countries helps fuel its economy. At one point I had considered taking the “death train” through the Brazilian Pantanal region and then by land to Asuncion, Paraguay, but once I worked through the logistics I realized that there was no way that my rear end would put up with four days sitting on a wooden train bench. After spending a day and night in Santa Cruz, it was time to say goodbye to Bolivia and head to Paraguay. As much as I was looking forward to exploring another country, I did not want to leave Bolivia: still so many places I would like to visit, mountains I would like to climb (especially Huayna Potosi) and things I would like to experience (horseback riding in Tupiza and volunteering in a school or orphanage, to name but two). But flights do not wait, so with my passport, visa, and backpack in hand, I headed to the Santa Cruz airport. I checked in with the airline carrier, got my ticket, checked my bag, cleared security and headed to the gate. While I was at the gate (which is to say, after no fewer than six people had investigated my documents), a flight attendant called me to the counter and asked to see my visa. She then informed me that my visa — which the consulate in Miami had originally told me was valid for 90 days upon entry to Paraguay — had expired two days prior, and that in fact Paraguayan visas are only valid for 90 days from the date of acquisition. I was so livid I nearly lost my head. I called the Paraguayan consulate rather perturbed (why else would I have bought the airplane ticket, if I had known that my visa would have expired by then?) and was told that unfortunately I would have to procure a new visa and would not be permitted to enter the country until I had done so. So much for saying goodbye to Bolivia… I spent an extra night there after all. I treated myself to a giant sundae for supper and tried to see the bright side of things once again. The next morning, I went to the consulate’s office, got a new visa, and retracted my steps to the airport. All of the people I had dealt with the day before personally greeted me, leaving me to wonder whether a “beware: angry customer alert” had been issued with my name. As I flew over the Amazon and into the Chaco of northern Paraguay, I was struck once again by the incredible diversity of Bolivia. The eastern part of the country is so lush, so green, and so very different from the Lake Titicaca that had greeted me upon arrival weeks prior. It is not only the climate and topography that are diverse; the languages spoken, the look of the people, and the economic bases also run the gamut. My mind wandered back to my first night in La Paz, when I noticed signs and slogans everywhere (in churches, buses, and even roadstops) encouraging people to “celebrate diversity,” “find unity in our diversity” and so on. At that time I had no idea of the breadth of diversity that exists in the country, and I have an entirely new appreciation of it now. These sorts of pondering led me to reflect on Eduardo Galeano’s critique of “development” in Open Veins of Latin America, in which he states, “Underdevelopment isn’t a stage of development, but its consequence. Latin America’s underdevelopment arises from external development (i.e. the growth and wealth of the US and Europe) and continues to feed it.” While I realize that there are many places in South America that I have yet to visit, I believe this statement resonates especially profoundly in Bolivia. It is a country which had (and potentially still has) enormous internal and natural resource wealth. Yet it has been pillaged by others economically and (in part as a consequence of this) has been unable to develop an internal market. Galeano noted that the existence of an internal market is one key to development, and the more global an economy becomes, the more difficult it becomes to develop one internally. Thus the gap between “banana republics” (and now “Volkswagen republics,” countries that provide the raw materials for export) and the countries that refine and add value to these materials will continue to widen unless and until countries like Bolivia have an economic base to call their own. Notwithstanding undertakings such as Mercosur, intra-continental ventures, and foreign direct investment, the country remains dependent on external factors (e.g. the international price of tin, debt servicing requirements, and competition from more efficient producers) for its economic survival. Taking into account a certain Darwinian element that “that’s just the way things are,” I cannot help but at the same time question whether ever-widening inequalities will persist, both among South American countries themselves and between the more developed North and less developed South. And at the end of the day, whose responsibility is it? Perhaps I am overly idealist, and yes I feel quite young at heart, but I believe that many in the north has failed in this fundamental responsibility to humankind. But enough of my soapbox for now. I absolutely loved Bolivia and cannot wait to return.